Chocolate puzzles wedding favors? Brides looking for a chocolate wedding favor unique and distinct to your big day have come to the right place. A one of a kind chocolate puzzle would make a great chocolate wedding party favor. This wedding favor unique in every way will definitely be admired, enjoyed and most of all remembered. These edible chocolate square puzzles come in four pieces that when put together form an adorable picture of your choice. 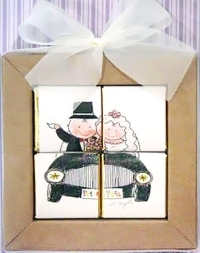 These favors are made in Spain and include a drawing of a bride and groom. Your puzzle could show a bride and groom fully dressed in wedding attire leaving in their decorated car. They are cute, colorful, cartoon-like drawings placed on delicious chocolate squares. The puzzle pieces are secured in place on a small box, slid into a sheer cellophane bag, and have a ribbon tied at the top. You can customize the ribbon to be color coordinated to fit your wedding. If you are planning a Christmas wedding, you could choose a puzzle with a winter scene. There are several holiday chocolate puzzle ideas. The luscious four squares of chocolate could form a picture of a snow globe, shooting star or a group of carolers. Each of these is also secured in cellophane but all come with a festive red ribbon. Each box measures four inches long by four inches wide, and the chocolate has a shelf life of six months. So set up a huge basket of these puzzles at your reception and enjoy the beauty of wedding favors. This chocolate candy wedding favor would make a lovely, charming gift for each of your friends and family to enjoy.